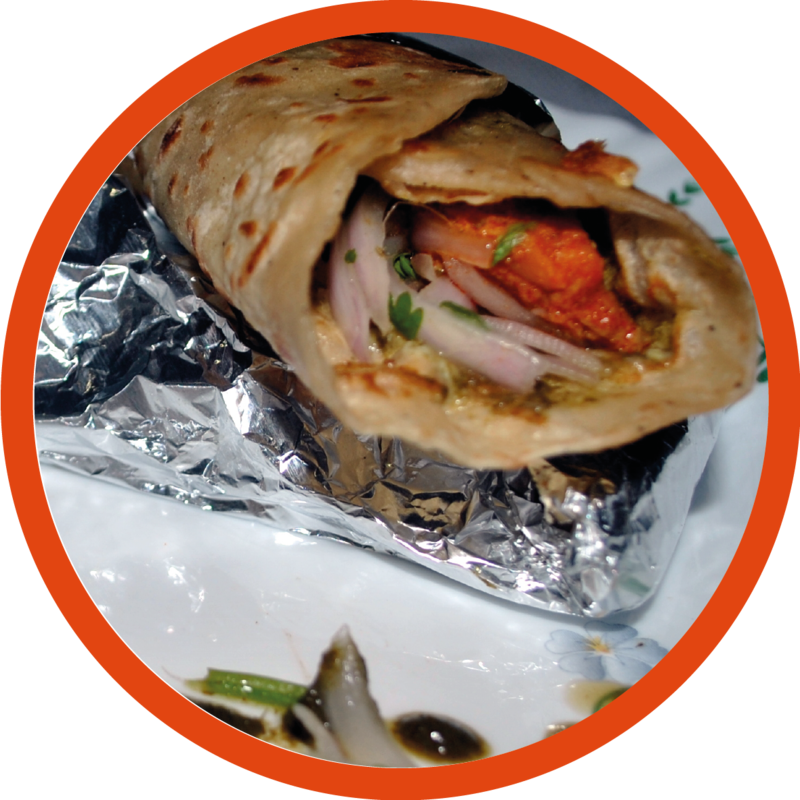 A popular Indian dish of roasted chicken wrapped in a egg coated paratha bread. Marinate chicken for half an hour with Ginger paste, Garlic paste, Red Chilli powder, Garam masala, Salt, Lemon and Yogurt. Keep refrigerated. Once marinated, in a pan heat oil on medium heat. Add all marinated mixture in the pan and cook until chicken is tender and fully cooked. Do not add water. Dry any excess liquid from the chicken. After the chicken is cooked, keep the mixture aside. Prepare Mint/Pudina chutney by grinding mint leaves, green chilli, salt, 1 tbsp lemon juice and sugar in a blender. Prepare garnish salad by mixing together thinly sliced onions, salt, lemon juice and coriander leaves. Mix all the ingredients well and keep aside. Add salt, oil and pepper to wheat flour and start kneading the flour by adding little water at a time. Do not use too much water. Make dough softer. Allow it to rest for 20 minutes. After 20 minutes heat tawa/roti pan and divide dough into equal balls. Make into a paratha with folds. Put paratha on the tawa and roast from both sides by drizzling some oil. Now pour 2 tbsp of beaten egg over the paratha on one side. Flip it and cook for a minute. Now put the paratha in a plate with egg side up. You can prepare all the parathas this way and keep them ready. Or start making roll one by one. Keep Paratha in a plate with egg side up and just before serving, smear mint chutney over the paratha on egg side. Fill chicken mixture at the border of the paratha. (Heat chicken filling before serving if it has cooled down.) Garnish with onion salad and now fold paratha into a roll. You can secure it with toothpick and then wrap half the roll with aluminium foil and serve hot. A sweet and sour recipe of boiled eggs which are fried and served with tamarind-sugar sauce and topped with fried shallots. Cut dried chilies in half. Heat up the wok and add 1/3 cup of oil. When the oil is hot, deep fry chilies for few seconds. Do not burn them. Remove and drain on paper towel. Peel and thinly slice shallots. Deep fry the Asian shallots in the same wok for 3-4 minutes until they turn golden brown. Remove with slotted spoon, then drain on paper towels. Now deep fry all the eggs at a time into the same hot oil. Deep fry for 10-15 minutes until each egg is golden brown. Remove eggs from oil and keep warm. In a small saucepan over a medium heat, add fish sauce, tamarind paste and palm sugar. Stir it for 5-7 minutes until sauce reaches smooth consistency. Cut fried eggs into halves and arrange on the serving plate. 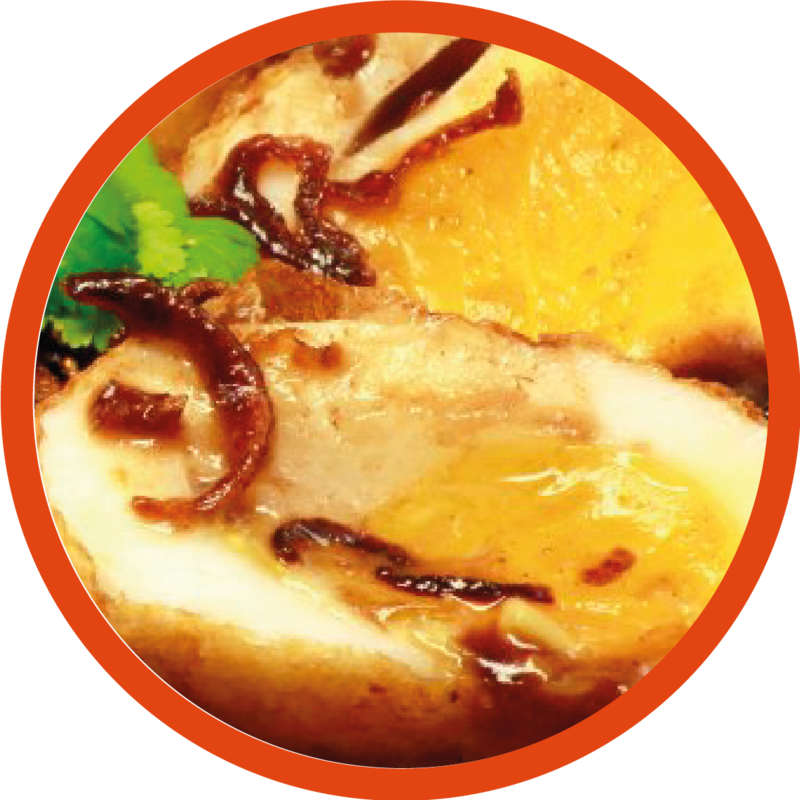 Drizzle tamarind sauce over it and sprinkle fried shallots and coriander leaves over it. Chicken filled steamed dumplings made with Tapioca. Prepare the chicken stuffing by stir frying chicken with garlic, oyster sauce, soy sauce, white pepper powder, onion, spring onions, mushrooms and coriander. Add salt to taste. Make sure the mixture is a bit sticky, so it hold its shape when forming a ball later on. Let it cool down. Add hot water to tapioca slowly in parts until it forms a sticky mixture. Mix well with hand. If the water is too hot use gloves. Let it cool and rest for 15 mins. Now take some tapioca paste in your hand and press it flat in the palm. Put a spoonful of chicken mixture in the middle and wrap it close forming a ball. Continue this until you make all balls. If it sticks to your hands, wet your hands a little. 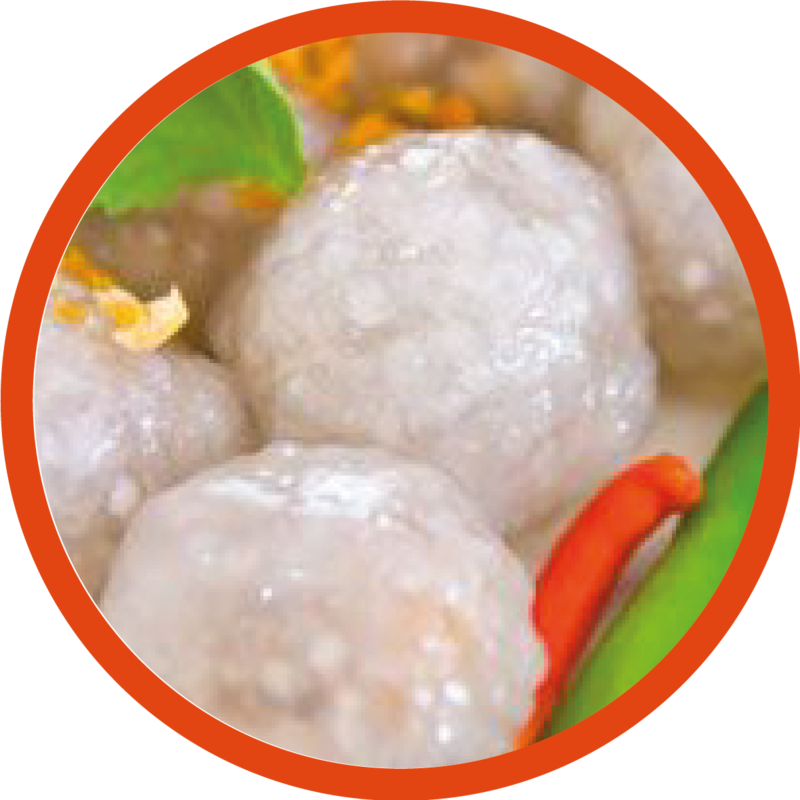 Keep these balls in a steamer or bamboo steamer and steam for about 8 minutes. Cook them until the balls looks translucent. Serve hot with spicy red sauce, cabbage, cilantro and red chillies.